Lambda Literary established a new award in Transgender Poetry for the first time one year ago. On the eve of a new Lammy Awards this year, we sat down to have a conversation with U of A Poetry MFA alumnus Trace Peterson, publisher of the first trans poetry book to win the award: succubus in my pocket by kari edwards. 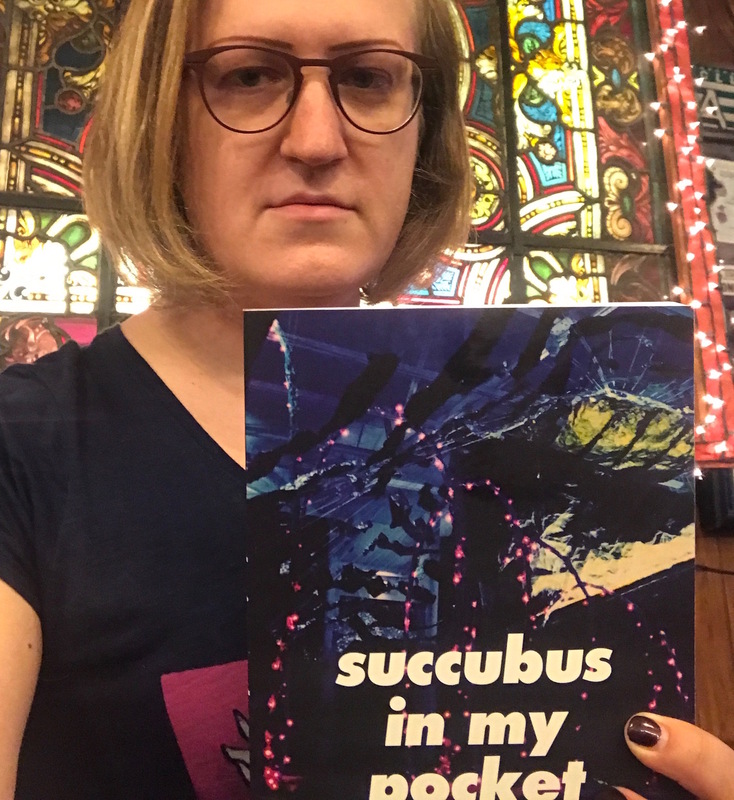 Poetry Center: Congratulations on publishing the first Lambda Literary Award Winner in Transgender Poetry, succubus in my pocket by kari edwards! How did you come to publish this book of poetry? Trace Peterson: Thank you! I was really pleasantly surprised by this award. It's a tribute to the risky and foundational work that kari edwards did in transgender poetry in the early 2000s. edwards was an important mentor for me in my late 20s when we were corresponding with one another from across the country, and then we eventually met and read together in Brooklyn around 2005. I had been trying to get up the courage to transition ever since around the year 2000 when I had come out to friends as well as in my poems, and from a distance kari seemed like the whole package as a writer: her work had and still has (it seems to have held up well) this ferocious ability to explode and unearth all assumptions about proper ways to use language. She wrote entire books without pronouns or capitalization. She wrote books of multilayered and collaged text with competing experiences of reading happening at the same time. She signed her books by crossing out her name on the title page and writing "NO GENDER." Her writing sometimes frightened and disturbed me—it was that good, because she took absolutely nothing for granted. kari was a larger-than-life figure, and in the short period of six years from when she transitioned in 1999/2000 to when she suddenly and unexpectedly died of a pulmonary embolism in late 2006, she wrote more than many poets write in an entire lifetime —at least nine books, by my count. succubus in my pocket is a key moment in kari's oeuvre, as the follow-up volume to her famed poet's-novel a day in the life of p which had been published in 2002. She worked on succubus (among other projects) in a writing group she created in San Francisco with Rob Halpern, Taylor Brady, Julian Brolaski, Eleni Stecopoulos, Joseph Lease, Donna de la Perriere, Marcus Civin, Frances Blau, and others between 2002 and 2004, when the manuscript of succubus was completed. So succubus corresponds to the period when kari and I were having our often inspiring, sometimes contentious dialogue with one another about poetics, trans identity, what it meant to be on the left politically, what it meant to do certain things with words, and what it meant to be a self or a non-self in a world where living as trans was uphill work, seemingly requiring of those pursuing transition something like an extreme act of will and an iron hide. The publication of this book came about when I spent a day hanging out with kari's widow Fran Blau in San Francisco, and Fran told me about the unpublished manuscript. I was excited when I read it to find out how brilliant it was and also how it took aspects of her book a day in the life of p (published by subpress in 2002) and took that project in other directions. Whereas a day in the life of p plunges us into the intimate and traumatic daily experiences of a character with five different names (name-pronouns? ), succubus takes us through the fragmented story of a character who seems to be navigating with great difficulty the multiple hostile forces of medical transition gatekeeping, political surveillance, self-help boosterism, and existential alienation of people from each other in a capitalist society, seen from a working class perspective. The sardonic, splintered consciousness of the narrator in succubus, who calls themselves "honey with an h," seems to represent one of many alternate dystopian trans narratives, persistently traumatized yet at times disturbingly gleeful. It really seems like kari's second book to be published after p that might be called "New Narrative" in its style and poetic concerns. And it's also a kind of shredded fiction, a scrambled narrative of hallucinatory proportions, which I think is absolutely perfect. Of course the first winner of the Lammy in Transgender Poetry would be a really weird novel that consciously plays with and disrupts processes of reading itself! PC: Can you tell us a little bit about EOAGH Books? TP: I've been editing the journal EOAGH for about 13 years now, with a brief hiatus that occurred between 2014 and 2016 when I transitioned. It has always been an online journal, and it was originally located at the Chax Press website. The first issue was published in 2003 or 2004 and was a portrait of the poetry community I had known in Tucson at the time, where I had just completed an MFA at the University of Arizona in 2002. Tucson is where I learned how to be a poet and the journal's nonsensical name (there is no correct pronunciation, don't worry) was inspired by a line in a poem by another important mentor, the poet-publisher Charles Alexander. In his book near or random acts, there is an episode where he sees the "sonic graph of a word" in a dream, and it's "E O A G H." Charles liked the tribute. I think it's one of the better journal titles. Since that initial issue, we have published a variety of different features but it's always been a sort of idiosyncratic personal vision from my perspective, addressed to topics and people I am connected with, and because of that has been especially focused on trans and queer writing. There was an issue dedicated to the memory of my friend Jackson Mac Low when he died. There was an issue called "Queering Language" which kari edwards was the co-editor of along with erica kaufman, Stacy Szymaszek, Jack Kimball, CA Conrad, and Paul Foster Johnson, and this issue among other things announced a temporary configuration of queer experimental poets in the mid-to-late 2000s, though the launch event was both triumphant and bittersweet because kari suddenly died in December just before the issue could be completed. There have been other themed issues, such as the 2010/2011 Peripheral Poetry issue edited by Tan Lin, and feature sections such as one on dementia edited by contributing editor Susan Schultz. EOAGH has only recently started publishing books, beginning with Andrew Levy's Nothing is in Here, a poet's novel about the credit crisis in 2011 written from the point of view of a character who is part talking dog and part splintered postmodern consciousness. The second book was of course succubus in my pocket, which has amazingly won the first Lammy in Transgender Poetry, and the third book was Mouth to Mouth by poet and filmmaker Abigail Child, which is currently a Finalist in Bisexual Fiction for the upcoming Lammy Awards this summer. I am keeping my fingers crossed for Abby to win, and I am so grateful that our strange books seem to be getting such an impressive response. Our next title this year, slated for release in the fall, is by innovative early trans poet Max Wolf Valerio, and it's called The Criminal: The Invisibility of Parallel Forces. PC: What was it like to be at the Lambda Literary Awards event and to accept the award on behalf of kari edwards? TP: It was nearly a year ago now so I can talk about it more easily at this distance. It was giddy and exhilarating and everything felt like it was moving in slow motion. It's the queer book Oscars and you get up on stage and they give you this big heavy glass book trophy and you give an acceptance speech. I had a lot to explain and I had not prepared anything to say, because I hadn't anticipated the book was going to win—two years before I had sat in that audience watching our foundational anthology Troubling the Line, a Finalist in the LGBT anthology category, lose out when the judges divided the category into "LGBT Fiction" and "LGBT Nonfiction"—no poetry. So I wasn't going to make myself vulnerable to the heartbreak again. Wouldn't you know, the year you don't prepare a speech is the year that you win. I got up on stage and my mouth became completely dry. The best I could do was thank everyone connected to kari who had been part of her life and part of the scene that I had known, and say a little about why I thought kari's alternately gendered vision, a "troubling of the habitual life story at the edge of the recognizable," was such an appropriate starting point for this award. One thing I regret not doing was to say, during that moment, how much I valued the work of Joy Ladin and Ryka Aoki, both of whom were also up for the award, both of whom have been so influential in trans poetry and literary activism, and both of whom I admire very much. Joy published her first book Alternatives to History about a year before succubus in my pocket was completed, so her career and kari's had overlapped by a few years. Ryka Aoki's powerfully moving poetry and prose have been inspiring trans writers for a decade, and I'm a big fan of her work. I would have been just as happy to see either poet receive the award and I had least expected the deceased poet to win, but it worked out in some unusual and odd way. It's worth mentioning that this Lambda award for succubus did not totally come out of nowhere. There's a way in which it feels like a moment of recognition for a poetic context I've personally been working out of and trying to make recognizable as a trans poet, and EOAGH has been a part of that context. EOAGH has been publishing trans poets for years and years when hardly anyone else was. EOAGH was also the original publisher we advertised when my co-editor TC Tolbert (editor's note: Tolbert is now Tucson's Poet Laureate!) and I first sent out the call for Troubling the Line, the first-ever anthology of poetry exclusively by trans writers, in 2011 or so, before we approached Nightboat Books with all of the poem requesting that they be a co-publisher. It turned out to be best for the book and for everyone that we finally decided together with Stephen Motika that Nightboat should be the publisher instead of EOAGH, because they have done a phenomenal job with the book and I couldn't be happier. PC: Do you find that poetry is becoming more interested in identity? In what ways? TP: It seems too hard to speak to tendencies of poetry in general these days, because there are so many sub-communities and such a wide range of styles and practices underway, though I can certainly speak of my own experiences with identity and the poetry scene. It seems to me that there have always been parts of the poetry world or the poetry scene that have been interested in identity, but with few exceptions, most of them have not been interested in trans identity. That is finally starting to change in the past few years now since Troubling the Line came out, but during the time kari was living and writing, the disinterest in trans writers seemed pretty widespread in US poetry. I have a few hypotheses as to why, but I will save them for a future article. My own work has always been a conversation between identity and language, and it has been hard to find readers who get both parts of the conversation. My prompt for the EOAGH issue of "Queering Language" argued that poems rather than just poets could be queer, and this seemed to have paradoxically convened a visible queerness that John Ashbery was willing to send us poems for. Similarly, when I co-edited Troubling the Line with TC Tolbert, we made an effort to bring together a lot of different kinds of aesthetics in one place by asking our contributors the question "How does this poem come from your body?" At the time when kari was most active and when succubus in my pocket was written, the poetry world was pretty starkly divided into a number of different camps and the camps I tended to be in were not very enthusiastic about identity as the central argument for a poetics. I think dealing with this avant-garde context and set of assumptions may have been one of the reasons it took me 14 years to transition after I had come out, frankly. If there was an interest in identity among avant-garde writers it appeared in New Narrative, the movement that kari was involved with, though she also seemed to have one foot in several other movements including Language poetry and Naropa-esque Beat poetry. kari stood in between an identity poetics, which she was very critical of, and a language-centered poetics, which she was also very critical of. In the context of the various abstract, often self-abnegating, and often anti-identitarian aesthetics popular in avant-garde writing at the time, she seemed to have found a solution to being a trans poet by including her existence as a trans woman, and her existence as dyslexic, as part of the universe of things being addressed and juggled in the poem. At the same time coming from the other direction, she was a trans woman who wrote about something other than just being trans, which was also unusual at the time. Her writing problematized aboutness in a politically provocative and ferocious way from a far left political perspective. By including identity and disability as part of her poetics but not limiting the mode to aboutness, she developed a form of so-called hybrid experimental writing before such experimental writing was fashionable. I think it's also specifically important that she took up this aesthetic stance as a trans woman. Like Sandy Stone's "posttranssexual" argument, and like Kate Bornstein's "gender outlaw" stance, kari edwards' ferocious poetry she anticipated what would become aspects of nonbinary identity by making this double movement that disrupted gender. Her vision of gender anticipated the more liberated standard of "informed consent" that we experienced becoming available in trans medical care from 2012 until the recent election, where for a time we could choose to begin HRT based on something other than exclusively binary standards. Yet at the same time, and especially in succubus in my pocket, kari valiantly raged against the medical establishment's surveillance of trans people's bodies, selves, and stories. She is one of the earliest punk trans women I ever knew, and is still one of the greatest. kari also did essential earlyl work in bringing trans poets together and making us aware of one another. As the poetry editor for Transgender Tapestry from 2000 through 2005, she blazed a trail by publishing a series of poets who represented the visible trans and trans-adjacent writers at the time: Julian Semilian, Oussama Zahr, Angela Dobbs-Sciortino, Julia Serano, Catherine Daly, Margaret Ricketts, Trish Salah, and me. What kari achieved was important in bringing together different communities, making a complex praxis of identity available not just in her work as a writer but also in her work as an editor and leader of a writing group. PC: Do you have any stories about the UA Poetry Center from your time here? TP: My introduction to the University of Arizona Poetry Center was when Charles Alexander hosted a reading there in 2000 shortly after I had arrived that included a wide variety of different poets and styes. Samuel Ace was a part of that reading, as was Charles himself, who read a poem about dreaming that his daughter came after him with a baseball bat. I was friends with Christine, Frances Sjoberg, Jonathan van Ballenberghe and others who worked there and hung out there. I have great memories of the poetry center in its old location, with its sign "A Local Habitation and a Name" as a fertile, dynamic, inspiring place where different groups came together. As a member of the Board of Directors for POG, I found myself visiting the Center's guest cottage occasionally, for example when I interviewed Ann Lauterbach during her visit in 2001. I also spent some time hanging out there with Jackson Mac Low when he visited. I remember the cottage didn't have a kettle for some reason at that moment, and I brought him one. As we talked, we also discovered the truly bizarre coincidence that my grandfather, who was a high school English teacher outside Chicago, had published some of Jackson's first poems in his high school literary magazine back in the sixties. When he went back to New York, Jackson left a note with the Poetry Center that said "thanks for the kettle, and the koincidence." I also worked at the Poetry Center for a semester and a summer in 2001, alongside Tim who was the librarian at the time. We spent weeks at the house of the late lesbian poet Jeremy Ingalls in Tucson going through her mansucripts and book collection. I remember a lot of posters of Chairman Mao, maps of China, and paraphernalia related to the cultural revolution. I catalogued a number of the books from her house for the Poetry Center Collection. Some of the work we did then eventually later led to the publication of Jeremy Ingalls Selected Poems, edited by Alison Hawthorne Deming and published by Kore Press in 2007. There were so many memorable readings put on by The Poetry Center in the early 2000s. I came back for visits after graduating. I saved all the posters and flyers. I can remember so many of the poems and they helped me become myself and someone else at the same time. I'm so glad the Poetry Center is thriving. Trace Peterson is a trans woman poet critic. Author of Since I Moved In (Chax Press) and several new forthcoming books of poems, she is also known as Editor/Publisher of the Lammy-winning press EOAGH Books, and as Co-Editor of the anthology Troubling the Line: Trans and Genderqueer Poetry and Poetics (Nightboat Books). 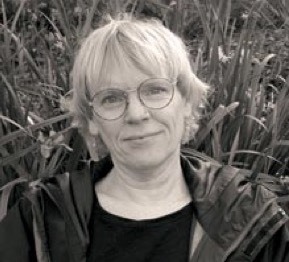 She most recently co-edited Arrive on Wave: Collected Poems of Gil Ott (Chax Press). Her recent poetry and criticism appear in TSQ: Transgender Studies Quarterly, PEN America, The Academy of American Poets (poets.org), Best American Experimental Writing 2016 (Wesleyan University Press), and Boston Review. She currently teaches at Yale University and Hunter College.